Woodcutting is a very profitable skill, and it is very easy to train as well. Just sit back and let this guide, and your character, do all the work. The basics of woodcutting could not be much easier, get any woodcutting axe that you can use, click on a tree, and drop, bank, or sell the logs. There really is not much more to do with this skill. As you can see it is a very easy skill to train. As with all other skills, there are a few ways to train woodcutting, power cutting or powertraining being one of them (explained in the fast experience section). You also can train by through slower methods but these will make you money and be a bit more relaxed. For every ten or so levels, a new hatchet/axe is introduced that you can use. Each new axe cuts wood a little bit faster than the previous one, so if you can afford the update, definitely upgrade! Inferno Adze 61 Complete the All Fired Up post-quest activity (requires 91 Firemaking). All hatchets except dragon, crystal, and the inferno adze can be dropped from Tree Spirits in the enchanted valley. Also, all axes except crystal and the adze are tradeable. The inferno adze is a special hatchet which can incinerate logs upon cut. It has the speed of a dragon hatchet. The fastest way to train woodcutting is not by banking the logs but instead dropping them. This can be done extremely quickly by dragging a log onto the action bar (you cannot be on legacy mode). Unfortunately, you cannot spam click the log on the action bar because the first option is not drop, it is craft/burn. You will have to right click the log and the select the drop option. If you position your mouse correctly, you can simply right click the log on the action bar and your mouse will be hovering over the "drop" option (you will need to position your mouse near the red dot on the right willow log icon on the below action bar). This allows you to drop an inventory of logs without having to move your mouse. You may also choose to get rid of the logs in your inventory by making a bonfire with them. This can train the firemaking skill as well, but your woodcutting experience rate will suffer. Beginning at level one and into the level 50s, the fastest experience for woodcutting is rushing through complexity 2 dungeons in Daemonheim and chopping down any woodcutting nodes you see. There are several downsides to this method however. For starters, you get no logs you can take out of the dungeon in return, meaning you will not be able to sell them. You also need to be proficient at dungeoneering, which is something most new players are not. For these reasons, it is suggested you only use this method if you are a veteran player starting up a new account, such as an ironman account. At level one, you will only be able to cut down normal trees, so you will have to start here. 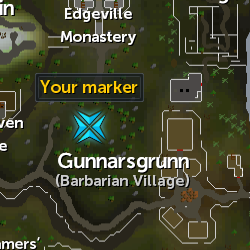 Normal trees are ubiquitous and very easy to find, however if you are finding it difficult to get a good woodcutting training area, here are two suggestions. 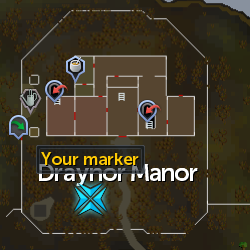 Draynor Manor Not very crowded and filled with dead trees. It has a dark atmosphere (which can be avoided by putting graphics on low). 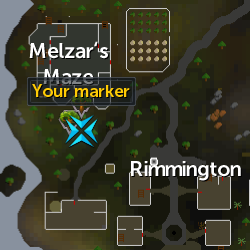 Medium distance from the Draynor bank to the south. South of Edgeville Monastery Trees are more spread out but not a dark atmosphere. 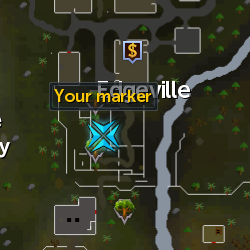 Bank is also a medium distance away in Edgeville. East of Varrock Similar to the previous location, but closer to a bank and fewer trees. Continue with this until you hit level 15. 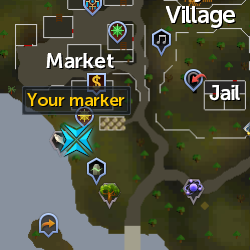 There is usually some market for regular logs because they are used in fletching and construction, so if possible you can quickly bank them for extra disposable gold. At level 15, you can chop Oak Trees. Oak trees are not like regular trees in that they usually contain more than one log per tree. 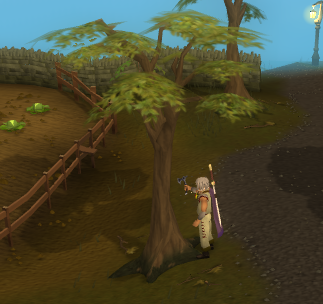 This makes Oak Trees slightly more relaxing for training; you can look at another screen while woodcutting. 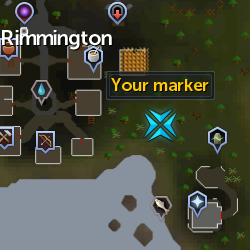 East of Rimmington Not close to a bank but less crowded than the Grand Exchange spot. 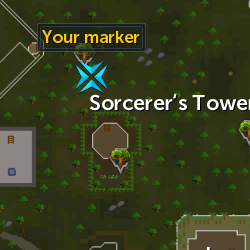 This is a better place if you plan on powertraining or firemaking. At level 30, you should move onto Willow Trees, trees that are found near water. 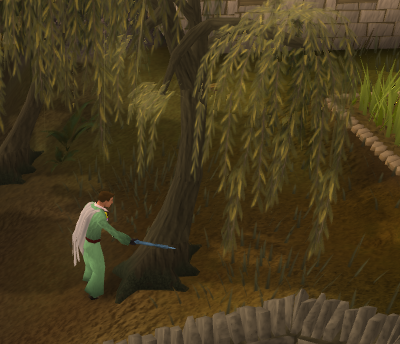 Willow Trees give you 67.5 experience per log, which is quite a lot at level 30. Willow trees are very relaxing and do not require full attention to the game. Draynor Village Very close to a bank but also very crowded. If you are interested in powertraining you should probably go somewhere else, unless you want people to socialize with. 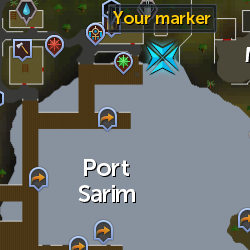 Port Sarim A nearby alternative to the Draynor Village spot, this area contains three trees and is moderately close to the Draynor Bank. 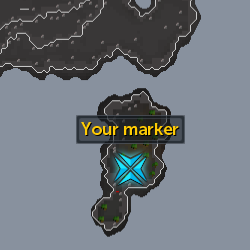 Daemonheim Resource Island Requires 30 Dungeoneering. 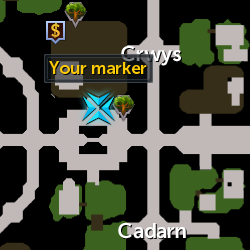 Bank is so far away that banking isn't even an option. This is moderately crowded but there are plenty of trees to go around. Also the only place you can cut Maple Trees in freeplay. If you are freeplay, you will likely have to cut willow trees until level 99. If you want variety (cutting willow trees over and over again can get monotonous) you could look at the maple trees at the Daemonheim Resource Island. Top experience rates for willows go at around 60,000 experience per hour. At level 55 (or when you get bored of Willow Trees) you should move onto Teak trees. They are similar to willow trees, but offer a bit more experience. 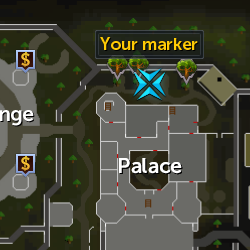 The main downside to these is that they can be difficult to bank. 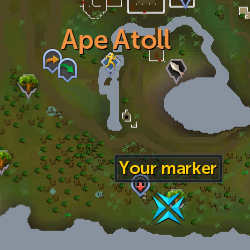 Ape Atoll One of the more popular places to cut teaks, but you must have started Monkey Madness to access. If you have completed the Deadliest Catch quest, you can use a nearby deposit box to bank your logs. May need a greegee to avoid aggressive jungle monsters. Tai Bwo Wannai Village A secluded spot which is usually empty. Banking is not an option here. 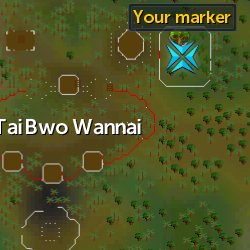 You must pay 100 trading sticks to enter (trading sticks can be obtained via the Tai Bwo Wannai cleanup minigame). At level 68, you can move onto choked ivy. Choked ivy is a very relaxed training method because the ivy does not get easily chopped down and also due to the fact that your inventory will not get filled up by logs. Ivy will be around 60-70k experience per hour, although at lower levels (under 80 or 75) you may get a lower number. 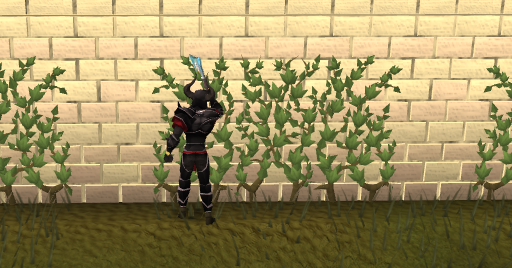 Southern Falador Wall A popular place to cut ivy, which is good for socialization but not as good for resource spot competition. Usually there is enough ivy to go around however. East of Varrock Palace Not as many ivy spots as previous location but easy to get to and also less crowded. Prifddinas In the Crwys section of Prifddinas. This requires Plague's End. You occasionally get an experience boost from the Voice of Seren. 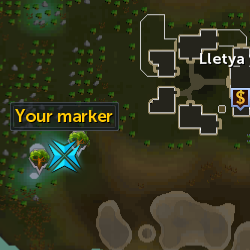 If possible, you should cut ivy in Prifddinas, as you will get a 20% boost on average one out of every four hours. 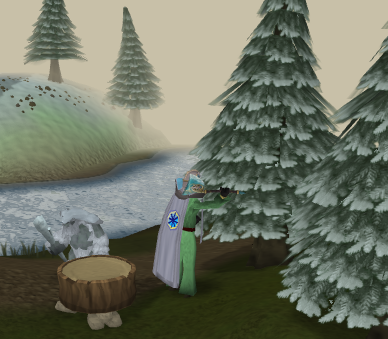 Arctic Pines can only be found north of Neitiznot, meaning you must start the Fremennik Isles quest to cut these trees. At a certain level, Arctic Pines become the fastest experience woodcutting experience in the game. 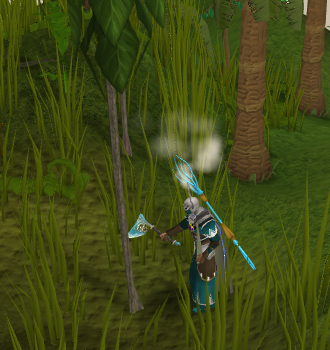 With Arctic Pines, you can expect to see experience gains upwards of 135,000 experience per hour at 99 woodcutting. At level 94, you can cut crystal trees. Crystal Trees are not quite as fast as Arctic Pines, but they are much more relaxed. Their exact locations vary hour per hour, which can get annoying. 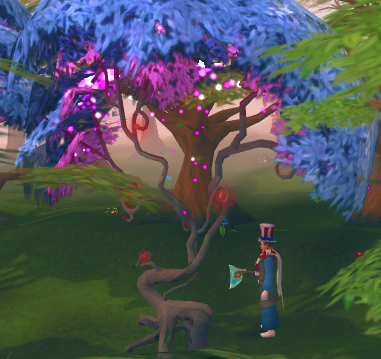 Crystal trees are similar to ivy in that they will not fill up your inventory with logs. Here, you can expect 100-110k experience per hour. 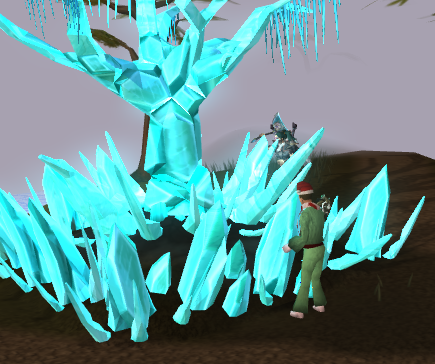 The unofficial world for crystal trees is 138. 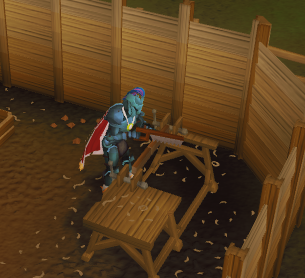 An alternative to the general "chop tree down" training methods are the sawmill jobs, which can be done at level 80 woodcutting. 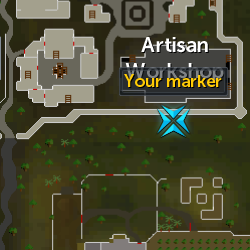 The Sawmill jobs can be done in the sawmill northeast of Varrock. The specific area where you do the sawmill jobs is an enclosed space in the southeastern part of the sawmill. To start a sawmill job, look at the jobs board and choose either a quick job or a long job (if you're going to be here awhile, choose the long option as this is generally better experience). Now, pick up logs from the pile of logs and put them into the chopper. You should get a pile of planks. Pick up these planks and click on the workbench to cut these planks up. You will need each type of plank for every job. You can see your progress towards your job on the upper left hand part of the screen. When you have completed a job, right click the Sawmill Overseeer and select "finish job." You will get a lump sum of woodcutting experience. This method is not super popular due to its fairly high attention requirement. It is slightly faster than the relaxed ivy training method, gaining 60-75k experience per hour. C2 resource dungeoneering is short for complexity two resource dungoneering. This method of training takes place while training the dungeoneering skill. The general idea here is to cut wood from the woodcuttign resource nodes in Daemonheim. Select a complexity two frozen floor and rush through the dungeon, looking for resource spots. Use general tactics to rush through the dungeons. There are upsides and downsides with this method. The upsides are that you can also collect from the fishing nodes to gain woodcutting experience as well, with little harm done to your hourly woodcutting experience. You will of course gain dungeoneering experience as well, for completing the dungeons. The downsides are that experience gains are sporadic (resources spawn randomly), this method requires full attention, and that you need to be efficient good at dungeoneering to do this well. Hourly experience rates are around 80k/hr for fishing and slightly higher for woodcutting, so between woodcutting and fishing you could be getting 170-180k experience per hour. Before we go into money making methods, it is important to note that currently in RuneScape woodcutting is not great moneymaking when compared to other money making methods. When woodcutting, it is unlikely that you will exceed 300,000 gold an hour. These methods are also not great training methods (with the exception of teaks) with experience values usually below 25,000 experience an hour. However, if you are looking at making some money while you're training these are the methods for you. At first, you should be able to cut regular logs and sell them. There is usually a decent market for regular logs. Unlike special logs, regular logs are used to create arrows. Regular logs are also used in construction. At level 15, you can cut Oak logs, which are better experience than regular logs but not as good money. Willow and maple logs are usually very cheap, so if you want to make any decent money between 15-60 you'll have to cut teaks or mahogany trees. Teaks and mahoganies are usually found in the same area. If you want to make money cutting these trees, you'll have to complete the Deadliest Catch quest to get access to the southern Ape Atoll deposit box. Teaks are also very good training. Edgeville Mausoleum Close to a bank, but only two trees. May be a bit crowded. South of Falador More trees, but farther away from a bank. Somewhat less crowded. South of Melzar's Maze Not very crowded at all but far from a bank. Teleporting to Falador, banking, and then cabbage patch teleporting and running back is the best way to get back. If you're sick of crowds, this is the place to be. Above Varrock Palace Similar to the Edgeville Mausoleum spot. 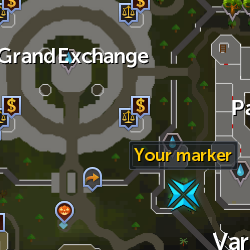 Conveniently close to the Grand Exchange, so you can sell your logs. 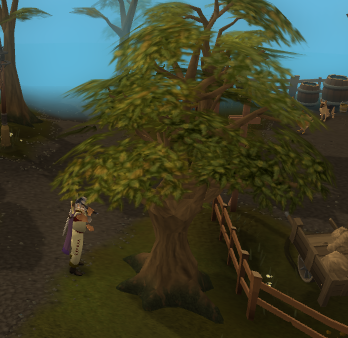 At level 75 Woodcutting, you can cut Magic Trees. 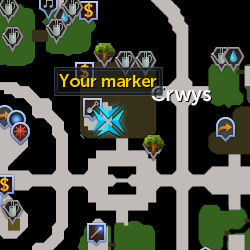 Money making here is slightly better than at yews. Seers Village At one time one of the few places to cut Magic Trees, this area has died down a bit in terms of crowdedness. Prifddinas In the Crwys section of Prifddinas. This requires Plague's End. You occasionally get an experience boost from the Voice of Seren. Close to a bank. Lletya Not crowded but the bank in Lletya is a moderate distance away. To speed things up, you can use the Elf teleport crystal to Lletya. Elder trees are level 90 trees that give Elder Logs. Elder Trees are unusual in that they never get chopped down. You will be given five minutes to chop the tree. After five minutes, the tree's branches will be depleted and you will have to wait for the branches to grow back or find another tree. 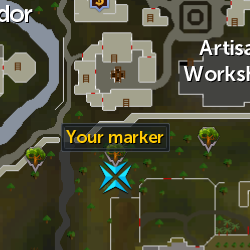 This makes Elder Trees one of the most AFKable activities in RuneScape, as you only need to check back once every five minutes. The general strategy here is to cut the tree, AFK for five minutes, teleport to a new tree, cut and AFK for five minutes, etc. As Elder Trees take longer than five minutes to grow back, you should have three Elder tree locations to run to. 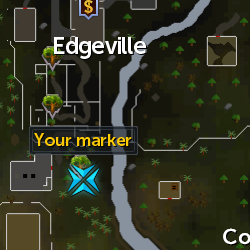 South of Edgeville Can be quickly accessed by using the amulet of glory teleport to Edgeville and running south. South of Melzar's Maze and northeast of Rimmington Can be quickly teleported to by teleporting to your house (if it is located in Rimmington) and running west. 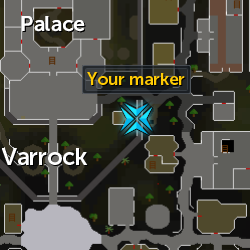 South of Varrock Can be quickly teleported to by using the lodestone teleport to Varrock and running east. Tree Gnome Stronghold This cannot be as easily accessed to as the others due to limited teleports to the Tree Gnome Stronghold. Try using a spirit tree teleport and running west. 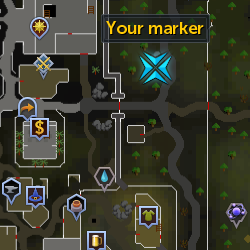 South of Draynor Can be easily accessed by Amulet of Glory teleporting to Draynor and running south. 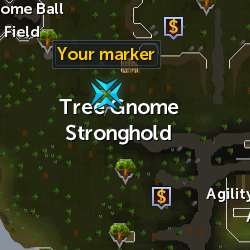 If you are looking for three trees to chop, try looking at the Varrock/Draynor/Edgeville trees. Skillchompas are chinchompas that give bonus experience to your logs when equipped. There are four types: Cobalt (requiring 31 woodcutting), Viridian (requiring 41 woodcutting), Azure (requiring 51 woodcutting), and Crimson (requiring 61 woodcutting). Every skillchompa will give 10% bonus experience but the higher level skillchompa will provide a higher chance of catching fish. Each skillchompa will also act as an hatchet for their respected level (so for instance a crimson skillchompa would act as a dragon hatchet). These skillchompas can be caught through the Hunter skill or bought on the Grand Exchange. Is it better to use crimson skillchompas or a crystal hatchet? The answer lies in the fact that you will get experience for failed "cuts" using the skillchompa but not when using the crystal hatchet, so the crimson skillchompa is better than using the crystal hatchet experience wise. Unfortunately, using the crimson skillchompas will likely cost you millions, so most people end up using the crystal hatchet. There are two special harpoon's that are called the Volatile Clay Hatchet and the Sacred Clay Hatchet. They can be obtained via the Stealing Creation Activity. 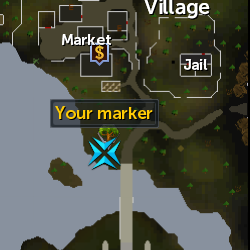 The Volatile hatchet gives an extra 120% more experience per fish and the Sacred Clay hatchet gives double the experience you receive from the logs. Like many other skills, you can use Summoning familiars to gain an invisible boost while woodcutting. Unfortunately, there is only one, low level familiar, the beaver, that gives a woodcutting boost. The beaver gives an invisible +2 boost while woodcutting, slightly increasing your chop rate. 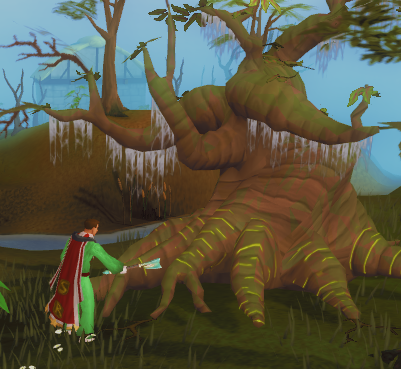 If you simply want some quick daily woodcutting experience, look into the divine trees. Divine trees are divine locations dropped by other players. To collect from a divine node, you need the appropriate level to collect the resource. For example, to cut a divine magic tree you would need 75 Woodcutting. Cutting these trees is much faster than it is normally. There is however a cap on how much divine woodcutting (or any skill) you can do per day. 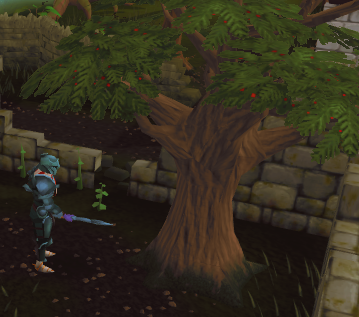 The highest experience divine woodcutting node is the divine yew tree. Cutting from the divine yew tree can get you over 40,000 experience in about five minutes daily. The Lumberjack outfit is a reward from the Temple Trekking minigame, received by killing the undead Lumberjacks during the broken bridge event. Each outfit piece grants a one percent boost to your woodcutting experience. There are four pieces and the complete set gives an extra one percent experience boost, granting a total five percent boost. It can take quite some time to receive the full outfit as some pieces are rare drops. Some players report it taking 10 hours to get the full outfit. 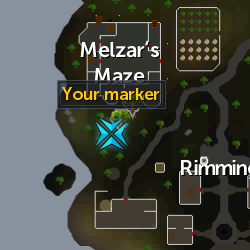 Doing the Temple Trekking minigame is a requirement for the Morytania tasks, so you might as well try to get the Lumberjack outfit if you're trying to complete these tasks. There are urns specific for woodcutting, which can be filled up while woodcutting with no damage done to your logs gained. There are four types of urns. The cracked urn works for cutting trees at or below level 15, the fragile urn works for cutting trees at or below level 35, the regular urn works for cutting trees at or below level 55, and the strong urn works for cutting trees at or below level 75. To fill up an urn, logs must be accumulating in your inventory. 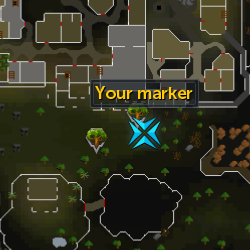 Hence you cannot use the urns while training on something like ivy where no logs accumulate in your inventory. If you have access to a clan citadel, you should be able to use the citadel woodcutting skill plot. While you are maintaining your citadel for upkeep/improvements, you should head to the woodcutting area. This will allow you to maintain your citadel and also train woodcutting at the same time. The woodcutting experience here is adjusted for your level, so you would get more experience at 99 woodcutting than you would at 90. Experience is close to the highest rates training via other methods. The woodcutting skill plot is also the fastest way to cap at the citadel. The Evil Tree is a fun Distraction and Diversion you can play to get some extra woodcutting experience.